The Redhead is a fascinating species in that many female Redheads make no nests of their own, but instead lay their eggs in the nests of other ducks. After mating, a female will either lay and incubate her own clutch, lay eggs in the nests of other ducks before she lays her own clutch, or simply lays her eggs in the nests of others and leaves to join the males. This diving duck is appropriately named and easily identified by its bright red head and gray body. The Redhead breeds in central Alaska, in the Great Plains, and locally throughout the West. It winters in open water across much of the United States and Mexico. Redheads are only found in North America and their numbers appear to be stable or slightly increasing. Description: The male of this medium sized diving duck has a rounded red head, and a blue bill with a black tip. His chest and rear end are black, and the rest of the body is gray. The female is a soft brown overall with a paler chin. Voice: The female give a soft, nasal grehp. The male courtship call is an eerie catlike meow. The Canvasback is similarly colored but has a uniquely shaped sloping forehead and bill. 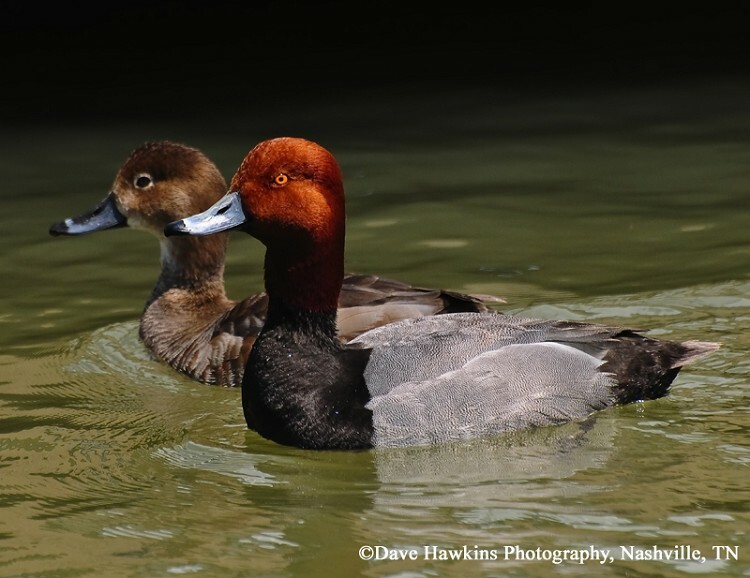 Habitat: In Tennessee, Redheads are found on deeper lakes and ponds. Diet: Submerged aquatic plants, seeds, and aquatic invertebrates. Status in Tennessee: The Redhead is an uncommon migrant and winter resident in the state, arriving in early November and departing by late April. The Redhead is known to lay eggs in the nests of other Redheads, and in the nests of at least 10 other duck species, and even nests of the American Bittern and Northern Harrier. The Canvasback is the primary host species where their ranges overlap. Many eggs laid in the nests of other ducks fail to hatch. The oldest known Redhead in the wild was 27 years 7 months. Best places to see in Tennessee: State and federal waterfowl refuges with deep water. Woodin, M. C., and T. C. Michot. 2002. Redhead (Aythya americana). The Birds of North America, No. 695 (A. Poole and F. Gill, eds.). The Birds of North America, Inc., Philadelphia, PA.